When you find yourself in that state of indecision between knowing that you want to give a gift and realizing that there is only so much time left, it is not uncommon to reach for that magical solution offered by the ubiquitous gift card. Keep in mind though, that the joy of giving is multiplied tenfold when you find just the right present for the right purpose. At that moment, as you watch your friend or spouse or child open up the package, you know that you’ve made a choice that will be remembered for a long time to come. To be perfectly frank, nothing says, “I really have no clue what to get you” like a gift card, and an Amazon gift card sends the same message. Sure, Amazon is the leading e-commerce mega store with innumerable selections in virtually every imaginable category. And granted, if you have no time to put into your decision, a gift card that can be applied toward some obscure Amazon product may provide a bit of internet surfing fun. But is it a memorable experience that leads to a gift your friend or family member will forever associate with you? Probably not. On the other hand, personalized gifts or engraved gifts gives you the opportunity to add a message, a note or a special date to the item of your choice. For example, you can give personalized gifts to celebrate an accomplishment or welcome a new baby into a special person’s life. When you give someone a $25 or $50 Amazon gift card it will buy a few books and CDs or perhaps a DVD or two. What’s more, you are leaving it to your friend or relative to purchase a gift for himself or herself. 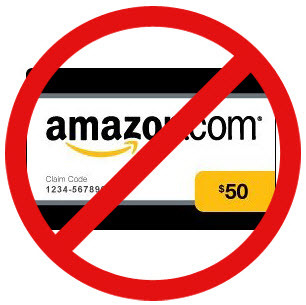 Unless those who receive your generic gift cards remembered to bookmark Amazon pages in the past, they will have to search by category, then by sub-category and scan down to find something that might be interesting. Then there’s the problem of shipping and sometimes the different items come from various locations, so the whole order may not be delivered at the same time. What if the gift card doesn’t cover shipping? When you visit our site, you can shop seven different ways for a gift meant specifically for the occasion you want to recognize. You can also choose to view products by recipient, by holiday, by specialty shops, by product, by types of wedding gifts and by types of business gifts. Our site is organized to help you shop for gifts for all the important people in your life and for just about every situation. If you want to give gifts that your relatives, friends or business associates will remember, choose to include a statement. Our site makes it easy and quick to find a present and make a personal statement at the same time. The all-too-generic gift card will not evoke a memory five years from now. A laser-engraved message that you create for a gift that suits the recipient and the occasion will be cherished and displayed for years.